AT&T Galaxy Note 4 owners are being treated to the slowest download in history, this morning, one that may very well be Android 5.0 Lollipop. It’s like the ultimate tease. At least one reader told me that he is over two hours into his download of this 1.1GB file. As you can see, I was momentarily at 0% and am now hovering around 7%. This is going to be a long one. I can’t get any clear confirmations on if this is actually Android 5.0, since everyone still seems to be downloading. AT&T also hasn’t updated their support page with official word on the update. So, if you have received this and actually updated, let us know! If your download hasn’t even started yet, go take a nap, we need all the bandwidth we can get. (Kidding!) Head into Settings>General>About device>Software updates. 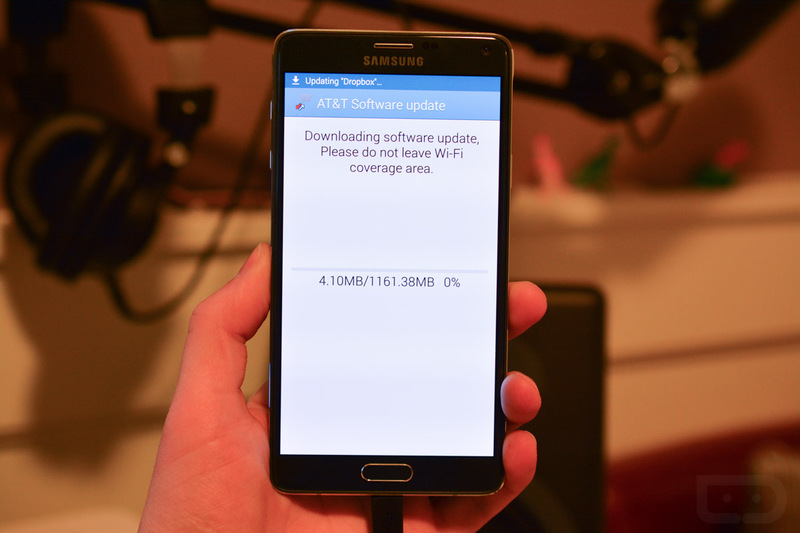 Did your Note 4 on AT&T get Android 5.0 this morning? Update: Sounds like it is indeed Android 5.0.1. Update 2: It is official now as Android 5.0.1. AT&T posted the changelog. Cheers Howie, Daniel and Rick!